Virtual Summer Hair Styles & Beach Hair - Upload Your Photo, Try Online Haircuts, Hairstyles, Hair Colors. For women & men! 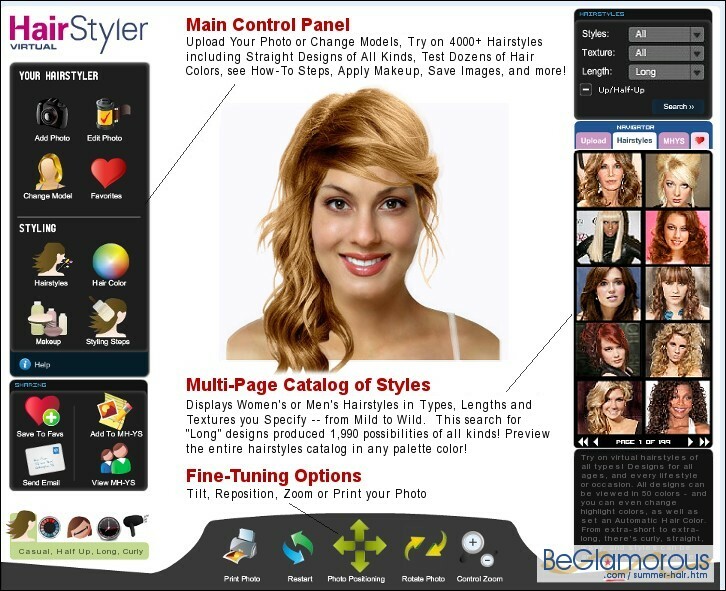 Test easy summer hairstyles online on your uploaded picture, in any of 50 hair colors. / Try wavy beach hair, short to long! Try on Virtual Summer Hair: Whether you're looking for simple, easy-care summer hairstyles or the flowing, wavy "beachy hair" look, the Hairstyle Selector has plenty of choices! Test all kinds of looks: short, medium, long; straight, curly, wavy, plus updos and semi-updos! There are designs for everyone -- you'll find hairtylesfor any facial shape -- round, diamond, heart, oval, oblong, square, rectangular or triangular -- plus styles for any forehead type, such as wide, high or narrow. The catalog of hairstyles offers an enormous variety of looks, from the latest to retro-vintage classics of the 1920s-1990s, side-swept fringe haircuts, styles for height at the crown, blunt-cuts, geometric cuts, trendy hair couture looks, and the list goes on! There are designs for every age, from teenage to adult, including hairstyles for women over 50 (or 30, 40, 55, 60, 70...), layered, plus bangs of all types -- brushed forward, front, side, wispy, chaotic, parted, heavy, blunt, curved, chopped/choppy, curled, eye-grazing, asymmetrical, long, short, tapered, angled, side-swoop, eyelash-sweeping, and feathered! Create your look. 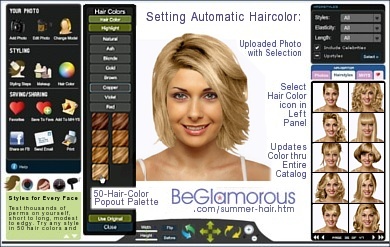 The hair color palette can even pre-set highlight colors for the perms you select. Mouse over any gallery thumbnail to see the original photo plus information. Remember that the Hairstyle Simulator's array of designs is gigantic -- with not only the latest looks (constantly updated), but also over 190 "classic" looks -- 4000+ choices in all. If you need help choosing styles & colors, there's even a wizard mode (see all features plus Q&A here) -- and a whole category of styles & haircuts for MEN, too! When you've finished your look, you can save, print or share the final result online (your private gallery of saved looks will build up real fast). If you need help or have questions, just click the "Help" button -- or, customer service is ready to assist! Have fun, upload your picture and try summer hairstyles on yourself now! The Online Hairstyle Selector app offers women's and men's perms of all types, textures and lengths, for any occasion - everything from Wall Street banker to absolutely wild - plus 50 hair colors and over 30 highlight hues. The Hair Color Chart (or Hair Color Palette) is accessed in the left control panel. On the internet, people often search for summer hairstyle pictures, wavy beachy hair looks, summer haircuts, or just summer hair in general. This tool lets you actually view & try hairstyles on yourself, for all types of needs (thick or fine hair, styles for 'older' or 'middle-aged' persons, that frame the face, that make you look younger or older, for thin hair, different kinds and different types of bangs (including bangs that frame your face, are longer on the sides, swag, lob and curtain bangs, see-through bangs, and cool bangs that make you look younger), and hairstyles of all types, for spring, summer, fall, winter, graduation, red capret events, African-American/Black, celebrity, quick & easy, cute, funky, trendy, corporate business professional & office work, school & prom, thick, thin, new & modern, bridal & wedding, and other types of hair ideas. Whatever you call it - summer hairstyles, peinados de verano, Sommer Frisuren, or Coiffures d'été -- this online software program is amazing (you can do basic editing on your uploaded photo to prepare it for usage. The site does not offer services such as free games or downloads). Whatever summer means to you -- surfboards, pool, camping, hiking, the beach & ocean breezes -- you'll find the right hairstyle! If you wonder "what's the best hairstyle for my face shape," or you just want to see yourself with blonde hair or purple hair, this tool lets you try hairstyle ideas for summer and see yourself with a different hairstyle - and it's fun & easy!